Quiche are such a great invention. If we use ready-made puff pastry dough to implement them, they are ready in such a short time and we can prepare a dinner quickly. If we decide to invite friends over for a drink, a quiche can be prepared the night before and cut into very small squares that look like such nice little delicacies. Quiche are also very useful if we want to bring something to work for our coworkers to snack on during a break or celebration. I ate a quiche for the first time during a trip to Paris many years ago. This was the famous “Quiche Lorraine”. When I came back to Italy, I tried the recipe. The “Quiche Lorraine” is very good but very high in calories. Over time I tried to find solutions that replaced the bacon with vegetables. Since we still find eggplant in September, the recipe that I propose uses it was the protagonist. Peel the eggplant with a potato peeler and cut into small cubes. In a pan pour the olive oil and add a clove of garlic, just add enough oil to saute the eggplant. Cook on high heat stirring frequently with a spatula cubes. They should brown without burning. After about 15 minutes, they should be cooked. Allow the mixture to cool while you prepare the filling. In a bowl, mix the ricotta with the cubed mozzarella, egg, parmesan, finely chopped parsley, and a little salt and pepper. Finally, add the eggplant in which you have removed the garlic, stir again. Coat a ceramic baking dish with pastry dough, prick the bottom of the pasty dough with a fork and pour in the filling. Fold edge of the dough over the filling and bake for 40 minutes. Serve the quiche in slices. 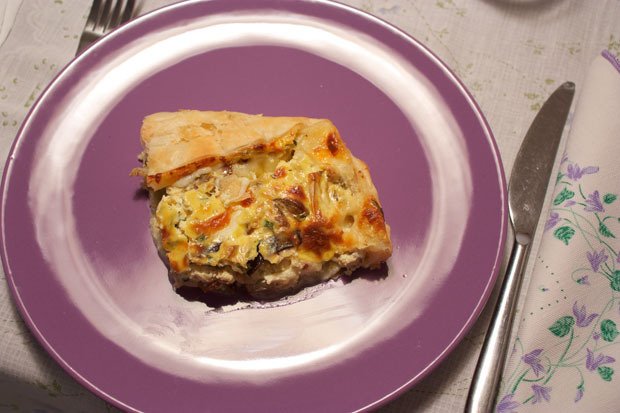 If you have leftovers keep them in the fridge, because the quiche is also good cold. Posted in Eggs and tagged with Eggplant Quiche, Torta Salata allle Melanzane. RSS 2.0 feed.